For most of us any threat to our expression of belief or opinion would be a threat to our personal integrity. Freedom of thought and expression is a hallmark of liberty and fundamental to a free society. This post raises questions about how the assumptions we make about beliefs and opinions can impact freedom, both our own and that of others. Our personal freedom, however, depends on accurate information, including the accuracy of our assumptions about the interests, beliefs, and views of others. What do our assumptions have to do with freedom? My answer is that our ability to engage effectively, safely, with real people in the real world, both friend and foe, depends on accuracy. Assumptions are beliefs about facts (or the views of others) that may or may not be true. My suggestion here is that unexamined assumptions can limit our knowledge of the reality we are dealing with, and thus our ability to respond effectively. Inaccurate assumptions interfere with the free flow of information, which limits our personal autonomy and independence. And so I ask you: If we have not investigated and fully understood opposing points of view, how can we engage with and influence others effectively? How can we question their assumptions? I do not suggest that agreement is necessary. That will often be impossible. But, being mindful of the dangers of untested assumptions can protect us from misunderstandings or worse. Questions of judgment often involve complex circumstances and depend on information coming from multiple sources. Sometimes complexity can be aggravating, but if we value the integrity of our beliefs and our role in the world, there is no alternative to pursuing accuracy. After all, our personal views reflect our identity as decent and intelligent people. Problems often catch us by surprise as a consequence of assumptions we did not realize we were making. This can happen socially or politically. It happens in science. I have raised a variety of questions in recent blog posts about historical assumptions that I think deserve a closer look. These included supposed promises that have long been accepted as inevitable by western society and by Americans in particular: The assumption, for example, that rational governance is possible if we simply trust the wisdom of experts, or that nature will eventually submit completely to human control. Today we face an extraordinary series of interrelated crises that call these and many other assumptions into question. Political dysfunction, social and economic disarray, and a nearly total lack of civility and cooperation, leave us enmeshed in frustration. As regular readers know, I have been suggesting that local communities provide the only effective opportunity for Americans to seek local security in the midst of social disorder. This is a very challenging proposition. But, I do not believe we have a choice. The lessons of civility, trustworthiness and cooperative problem-solving may have to be learned by force of necessity. Our survival might depend on them. Teaming up with a diverse group of neighbors to meet shared needs will not be easy. It will require personal courage and initiative. Understanding does not necessarily lead to agreement, but it lubricates and sustains working relationships. It is the path to genuine trust. The greatest challenge for building community in a disintegrating society will not be differences of opinion, but differences in our values. We each have numerous values, perhaps more than we realize. Values are not casual ideas or choices; many are deeply rooted in our interests and needs. If we are to live together, certain essential values must be shared; others might challenge our patience, but not our trust. To find safety in community we will need to seriously examine our assumptions in the clear light of honest dialog. I believe we will find more agreement than we expect, but we cannot delay. Dependable community will depend on genuine understanding. We must never abandon our values, but rather control the manner in which we manage them. Each of us carries a personal perspective that will contribute to the character and wisdom of the whole – as long as we refrain from allowing ego or emotion to overwhelm the context in which we find ourselves. We must learn how to work with others, to influence one another little by little, and to live with grace and charity. Note to regular readers: Please watch for the next post on or about February 10. Questions about the meaning of liberty and freedom have been with us for centuries. Even now, we are confronted by contradictions and constraints. In the coming months we will ponder the challenges of transcending our limitations – and keeping a positive attitude in difficult circumstances. As we proceed, I will refer the implications of religious faith to individual judgment. Certainly belief in an all-knowing God imposes constraints on our decisions and behavior. It can also liberate the heart and mind in entirely transcendent ways. Here we will focus instead on the spirit of freedom as it can be experienced by thoughtful people of every stripe, religious and non-religious alike, as we engage and prevail over the obstacles and strictures that present themselves in our personal, social, and material lives. Of particular significance in our present circumstances, our relationship with nature looms large. Many Americans have a great love for the extraordinary beauty of this land. And, our future depends on it. This is our home and source of sustenance, yet we sometimes seem to forget our dependence on it. Two hundred years ago scientists, philosophers, and politicians all expected that nature would ultimately come under human control. Human beings certainly do have a unique capacity to manipulate nature. But, as science has begun to understand the complexity of natural systems, it has become clear that the balanced order of nature must be sustained to ensure the survival of life on earth. Setting aside the controversy surrounding climate change for the moment, the idea that nature has limits when it is sufficiently disrupted seems to make sense. When I was a child there were two billion people alive on this planet. Now, having recently reached retirement age, I understand the number is seven billion and growing rapidly. This has taken place in a single lifetime. My lifetime. I cannot see how seven billion human beings, along with a massive agricultural and industrial footprint, can fail to impose a strain on the capacity of nature to provide the clean air and water we all depend on. I believe this question is worth thinking about. Yet, any suggestion that absolute freedom has collided with limits in the real world seems to cause a violently negative reaction. If freedom appears to be threatened by science, this would be no small matter. And so a disagreement that appeared at first to simply raise questions as to material fact has instead descended into bitter accusations of conspiracy, treason, and dishonor. Am I wrong to think that this reaction is about more than climate change? The emotional climate suggests that freedom itself must be under attack. There are many aspects of our lives that impose on our freedom. Physical reality is just one. Today we find ourselves colliding with limitations on many levels, personal, social, economic: the loss of privacy and economic freedom, violence on our streets, aging infrastructure, conflicts over land and water rights, insolvent financial institutions, and massively indebted governments. Shall I go on? It gets to be crazy-making, you know? Emotion coalesces into a rage focused on those who may have effectively driven us off a cliff. Who is responsible for all this, we ask? Bankers? Politicians? Corporate executives? Are these not people who are supposed to understand what they are doing? Whether it is the limits to nature that are in question or a deteriorating social and economic order, clearly the cherished expectations of ultimate human prosperity are no longer assured. The prospects for peace do not look so great either. We are confronted by crises that appear to be approaching from every direction. It is a time for each of us to begin adjusting to new conditions, new questions, and new ways of thinking. We owe it to our children to keep our wits about us. We are Americans. We are capable, imaginative, constructive. Coming to understand freedom in a way that transcends human limitations has become very important. We each have the capacity to think for ourselves. We must commit ourselves to the independent investigation of truth, and not allow ourselves to be overly influenced by others. The future and the responsibility are ours to claim. Note to regular readers: I have been rewriting the draft introduction for the book and would appreciate your feedback. You can find it on this page. Please watch for the next post on or about January 27. When America was first being settled by Europeans, the emerging identity of the new nation was characterized by a hopeful confidence in the future and a belief that freedom would lead ultimately to general prosperity and peace. The “will to freedom” as conceived by philosophers and treasured by American settlers and colonists, thus became the dominant theme on a continent that seemed unlimited, but for the noble peoples it displaced. We have not been willing to tolerate anything that stands in our way, including those once proud and independent indigenous American peoples who, despite heroic resistance, were forced to give ground to the relentless advance of western expansion. The contradictions hidden in the vision of absolute freedom and unlimited prosperity have remained largely unconscious and unresolved, whether they be social, economic, or physical. Forced by extraordinary circumstances, our attachment to illogical assumptions and inflexible absolutes is today pitching us into a confusion of emotionally charged philosophical and political conflicts. Several related questions were raised in previous posts. Do we still think we can make ourselves “master and possessor of nature” without regard for the coherent balance that physical life depends upon? Is absolute freedom even possible, given the complexity and destructive potential that science and technology have introduced into our lives? What do we expect of technology? What of the vulnerability of aging infrastructure we depend on for electricity and water every day, or the steadily growing impact of robotics on the economy and jobs, or swiftly advancing surveillance technologies that are capable of prying into every corner of our lives? Finally, what do the changing realities we face today suggest about the practical meaning of freedom and responsibility – and the necessity for cooperative problem-solving? Can we collaborate with one another to address these questions and retake control of our destiny as wise, creative, and courageous people? The historic questions have taken on a contemporary quality, but they are essentially the same questions. Earlier generations evaded these questions by exalting science and materialism above all else. Consequently, the denial of a rational God and the suppression of a religious perspective diverted attention from a logical contradiction that transcended philosophy and belief. When the constraints and limitations imposed by belief in an all-knowing and all-powerful God were disposed of with the cry of “God is dead!” they were immediately replaced by constraints and limitations imposed by belief in a supposedly mechanical natural world. It was, of course, assumed that science would soon master nature, human beings would succeed in perfecting rational governance, and humankind would realize absolute freedom. But, nature proved to be far more complex and unpredictable than was expected. And, having rejected the God of traditional religion, humankind has found itself confronted with a severe discipline imposed by nature, and without the grace or guidance of a loving Teacher. And “rational governance”? Well, we have certainly witnessed in graphic terms the manner in which self-appointed leaders of “rational thought” led us into the totalitarian nightmares of communism, fascism, and Nazism. Please make no mistake: This past is not far behind us. If we are to reconsider the cataclysms of the first half of the twentieth century and the horrific consequences of the many bungled attempts to control human destiny – politically, economically, and scientifically – we might start to see the future more clearly. Indeed, we might then avoid potential disasters before they befall us. We cannot neatly sidestep such fundamental unresolved questions, which I would suggest have embedded themselves deeply in the American psyche. Agreement concerning the details is not required, but taking responsibility for the practical consequences of our actions in the real world is of immense significance. A note to readers: Please watch for the next post on or about January 13. Regular readers can register for email alerts by clicking “Follow” on this page. What makes America different? During the formative years of colonial America something extraordinary was happening in the world. Beginning in Europe, new ways of thinking were breaking free from authoritarian institutions and belief systems. A creative energy was released that came to America with a rising flood of immigration. The new ethos was grounded in the belief that a rational humanity, freed to recreate the world through the power of reason, must be capable of discovering effectual truth. The idea of a promising future for humankind was powerful, inspiring confidence in the potential to free ourselves from the shackles of an oppressive past. And, for the thousands of immigrants disembarking in the New World, a working knowledge of philosophy was not required. Everyone knew what America represented, and the promise, however primal and unformed it might be, came to root itself deeply in the emerging American identity. Europeans were fascinated by the self-assured confidence of the American character, and Americans were energized by their freedom from the fetters of an autocratic culture and restrictive social norms. There were abundant crises and controversies, of course, to arouse and vitalize the new nation as it struggled to find its feet. We did not agree on much. The country was saddled with the unfinished business of its European past: the scar of slavery, the tensions between moneyed and working classes, and the prejudices of religion, race, and nationality. Yet, a potent hopefulness prevailed as wave after wave of European arrivals powered the growth of a seemingly insatiable industrial economy. Despite apparent contradictions, the new ideas continued to generate a confident vision on both sides of the Atlantic through most of the nineteenth century. While much of the brutality perpetrated against Black and Native American people was ignored by Americans of European descent, the horrific violence of the Civil War shocked the Nation. And then came the twentieth century. “The view of history as progress was severely shaken by the cataclysmic events of the first half of the twentieth century, the World Wars, the Great Depression, the rise of totalitarianism, and the Holocaust. What had gone wrong? Modernity, which had seemed on the verge of providing universal security, liberating human beings from all forms of oppression, and producing an unprecedented human thriving, had in fact ended in a barbarism almost unknown in previous human experience. We have admired the generation of Americans who prevailed during the Great Depression and fought in World War II. We like to call them “The Greatest Generation.” They did not forget. They remained proud and frugal for the rest of their lives, though many of their children failed to understand. Most are gone now. How many of us today know what they knew…? We who have drowned ourselves in materialism purchased with debt. I believe we have tried to walk away from the past with little understanding of what happened. Both the fear of debt and the destruction of global war have been largely repressed and lost to memory. The long history of degrading abuses suffered by immigrants and people of color is often forgotten and rarely addressed. The promises of equality and freedom remain, but are only apparent through a haze of inconsistency and uncertainty. The practical limits of freedom in a complex world have started to close in on our lives, unforgiving in the absence of clear thinking and moral responsibility. Are we ready to reflect on where we have come from and to confront the oncoming confluence of crises with responsibility, and with our eyes wide open? Note to regular readers: The blog will take a break until the end of the month. To receive emailed alerts, please click the Follow button. Among the most influential ideas influencing colonial America was the concept of independent human individuality. First appearing in ancient Greece, and then more coherently during the Renaissance, a new sense of independent individuality led naturally to the compelling idea of personal freedom. These conceptions spread together in reaction to an authoritarian European culture of dynastic families, medieval guilds, and other autocratic institutions. The term “individualism” apparently first came into common use among political philosophers in the late 18th century, leading almost immediately to confusion. Differing interpretations ultimately engendered two fiercely competitive philosophies. But, that’s a story for another day. My purpose here is to consider liberty from our perspective as individuals. Individual liberty has sometimes been associated with egotism and selfishness. However, the concept was originally conceived as respect for the validity of the views and experience of the individual within his or her own sphere, and the ideal that each of us should be encouraged to develop our own natural gifts. These ideas were championed by the humanist movement of the 15th and 16th centuries, which began as a dialog among Christian thinkers and generated considerable controversy. Some of the resulting conflicts have never been resolved. Humanism has come to be regarded as a secular philosophy in recent times, but religious interpretations remain strong. The interrelated ideas that ultimately became most influential in the development of western civilization focused on the will to freedom and the notion of human control over nature. Early humanist thinking gradually crystallized into the conviction that an ideal future civilization would bring freedom and prosperity to the world through the progress of science and rational governance. The philosophical contradictions were, however, swept under the carpet and remain to this day. While the physical realm of nature and the constraints of a complex society impose inevitable limits to freedom, these realities have rarely entered into consideration. We face constraints to our freedom every day. We care for our families, whatever that requires, and cooperate with the requirements of our employment. We commit ourselves willingly to civic responsibilities, athletic teams or dance recitals for our kids, charitable organizations and religious communities, all of which can take up most of our wakeful hours. And, we rarely fail to notice the impositions made upon us by government and the weather. As with our social circumstances, the physical environment presents obstacles and burdens. We normally take these things for granted. But, there is more. The challenges to our sense of personal independence and integrity seem to be everywhere today. Even our values are challenged. Many things can chafe in life, particularly the actions of others. Domineering and dysfunctional institutions are particularly aggravating in a time of deteriorating social conditions. Yet, human beings have always risen above the natural constraints in life to find meaning and purpose in a social world. As Americans in the early years of the 21st Century we face a simple question – in very complex circumstances. What do we value here? What is it that humankind gained with the founding of the United States? Where do we wish to take it? I believe we will find it useful to reflect on the meaning and purpose of liberty, a vaguely defined idea that has been central to the American character for more than 200 years, but which has led to illogical thinking and unconstrained behavior. An inquisitive mind and a questioning attitude are of greater importance today than ever before. Muddled thinking, stubborn miscommunication, and useless antagonism can easily subvert our best intentions. In the coming months we will explore the dangers of unexamined assumptions and the role they have played in our past. A note to regular readers: Please watch for the next post in just one week, on or about December 9, after which there will be a break until December 30. In recent years commitment to the integrity of the United States Constitution on the part of political leaders and others has been seriously questioned. This is a serious charge. Those who understand and value the importance of the Constitution, will also understand the importance of remaining vigilant in its defense. This is an emotional concern for many people. The recent proliferation of armed citizen militias across the country has drawn attention to the strong feelings associated with it. Clearly it would be wise for us to think pragmatically about how we can ensure the integrity of the Constitution. And, this requires thoughtful consideration of means and ends. An unrestrained emotionalism that leads to destructiveness could cause precisely the opposite of its’ intended purpose. Americans can easily recognize the challenge of this logic. In the heat of battle nothing is more important than a clear mind. Yet, we human beings are emotional creatures. So, let’s take a look at the reasons why incivility, antagonism, and especially the threat of violence, will actually subvert our efforts to defend what we believe in. I suggest four reasons here, as follows. First, force, or threat of force, subverts the Constitution itself, immediately destroying its’ capacity to function as intended and effectively nullifying its existence. Indeed, the Founders created a structure for governance that depends on civility and moral responsibility among participants. The Founders depend on our readiness to adjust our behavior accordingly, so as not to subvert the dignity and integrity of their purpose. Second, hostile tactics conducted by even a tiny minority would make it difficult, even impossible, for more disciplined and rational strategies to be mounted effectively. Indeed, such actions could actually set back their own cause for decades. Why? The use of force by a militia group would harden the attitudes of most Americans toward their stated purpose or philosophy. This would make it far more difficult for any of us to win a fair hearing from citizens who respect the rule of law. Third, any rebellion by force of arms pits itself against the uniformed services – police agencies and the military. These are our sons and daughters, brothers and sisters, and sworn defenders of the Constitution. Members of militias need to be clear who exactly they intend to fight, and who they would rather attract and win over in a battle for hearts and minds. Fourth, the vast majority of Americans value the character of the United States deeply. And, they recognize the fundamental role of the Constitution in making it all possible. If we wish Americans to have a better understanding of how the Constitutional structure of governance should function, it will not be accomplished by beating them up. Rather it will require rational argument that can be heard and understood. This means committing ourselves to teaching what we believe in, and learning how best to do that. Not only do we depend on civil order for the safety of our families, for safe streets, jobs, schools and hospitals, but there is a fundamental principle involved: We cannot defend what we believe in by tearing it down. The course of action that will preserve the Constitution and renew the strength of the Union calls us to address our countrymen with well-considered reasoning, presented compellingly and in a composed and self-possessed manner. The Constitution will last far into the future if, and only if, Americans stand by it with steadfast adherence to the rule of law and the civility the Founders expected of us. A note to regular readers: During the holidays blog posts will appear slightly less often. Please watch for the next post to appear on or about December 2. A description of the project and several chapter drafts appear elsewhere on this page. The United States Constitution holds a unique place in history. The framers stepped away from the customs and tyrannies of the past to devise a new model for governance envisioned for a free and civilized people. It has endured for more than two hundred years. Are we willing to overlook the subsequent missteps and mistakes, the rude and selfish behavior, to consider what is truly of value to us? Are we prepared to step forward to defend what we wish to preserve? If we let this inheritance die, what will we have lost? The record has been rough-hewn, but how could we expect anything like perfection when we have gathered the human race together from across the world into the managed chaos of a democratic republic? We are blessed with a brilliantly conceived structure for governance that has channeled the energies and creative genius of the world’s people into a dynamic force for capacity-building and prosperity. As I tried to illustrate in the previous post, the founders made an effort to see the end in the beginning. We now stand at another profound turning point in history, a moment requiring a visionary maturity from Americans of all colors, stripes, and viewpoints. I do not suggest the impending election is such a turning point. I speak of something far greater and more profound, a shift in attitudes and thinking that will require at least a generation to comprehend and internalize. In the coming years we must find our way through a sequence of social and material crises that transcend partisan politics. These troubles are the consequence of foolishness, mistaken assumptions and a lack of responsibility and foresight over the course of many decades. Shamelessness and iniquity have walked together on this land. There are those who think 200 years is a reasonable age for a democratic republic to reach its’ natural demise. However, the United States of America remains an extraordinary model of spirit and governance, despite the blemishes. I think it more reasonable to understand 200 years as the age of maturity, shaped by experience and illuminated by the affairs of a disturbed world, when this nation must necessarily come of age. We have responsibility for a trust grounded in the heritage of the American idea. Indeed, it is the responsibility to provide a faltering world with the vision and stability to support the next surge forward by the human race. This is a trust that no other nation has the vision, the strength of will or the generosity of spirit, to embrace. Brought into focus by the creativity of the American founders, it shines even now from the darkness, a beacon amid dangers and hardship. Human imperfections remain. Those who point to the evils and injustices of the past and present are serving a necessary role. Certainly we must not forget the ignoble or wrongly conceived. It is not useful, however, to condemn the vision and good will that give character to what the world has admired. Questions also remain. Thoughtful citizens will reconsider the requirements that liberty imposes in the way we handle our civil discourse, our disagreements and decision-making. Surely there can be no freedom for thought, for creativity, for social and economic advancement in the absence of the civility and self-discipline that allows us to engage freely and without fear. Recognizing the necessity for the social stability upon which all else depends, a practical reality confronts each of us every day. Have we matured to the degree that we can represent our personal views patiently, listen with understanding, and, when necessary, live with our differences? The crisis-fueled tensions of the early 21st century leave us wondering. Ultimately, stability and prosperity depend on our ability to engage in meaningful problem-solving, and to accept our differences within the supporting constraints of shared principles. If we fail we could lose everything. Please look for the next post on or about November 11: Standing together for the American idea. A note to new readers: To receive email alerts when posts are published click the Follow button. The structure of the Constitution is simple yet profound. It carefully restrains the passions of factionalism, however intense, from imposing destructively on either minority or majority. It limits the potential for regional conflict and ensures the strength to confront external threats. To understand how and why we depend on the Constitution as we navigate through crises, it will be useful to consider both the reasoned manner in which it was conceived and the negative reaction that it at first inspired. It can be instructive to review some of the numerous essays and polemics that were published in the American colonies during the period when the proposed document was being considered for ratification. Among these, a series of 85 commentaries was published in 1787 and 1788 by three members of the Constitutional Convention for the purpose of supporting ratification. The three writers, who originally shared the pseudonym, “Publius”, were Alexander Hamilton, John Jay, and James Madison. Later consolidated into a single volume as The Federalist, the assembled papers were said by Thomas Jefferson, another participant at the Convention, to be “the best commentary on the principles of government, which ever was written,”[i] a view many legal scholars agree with today. The Federalist is often cited in major court cases and has appeared in the debates surrounding virtually every constitutional crisis. Another collection entitled The Anti-Federalist Papers and edited by Ralph Ketcham is also available. In the end, the outcome turned out not to be in question except in New York, where the State Constitutional Convention passed it by only three votes. But, the issues remain instructive and have a similarity to some we find ourselves engaged in today. As an example, I refer here to the way the framers addressed a familiar challenge to both basic freedoms and effective governance. In The Federalist, Number 10, James Madison argues that there is no more important purpose in structuring a sound government than that of limiting the “violence” of factionalism. “As long as the reason of man continues fallible, and he is at liberty to exercise it, different opinions will be formed. As long as the connection subsists between his reason and his self-love, his opinions and his passions will have a reciprocal influence on each other; and the former will be objects to which the latter will attach themselves. “The latent causes of faction are thus sown in the nature of man; and we see them everywhere brought into different degrees of activity, according to the different circumstances of civil society…. So strong is this propensity of mankind, to fall into mutual animosities, that where no substantial occasion presents itself, the most frivolous and fanciful distinctions have been sufficient to kindle their unfriendly passions, and to excite their most violent conflicts. “But the most common and durable source of factions, has been the various and unequal distribution of property. Those who hold and those who are without property have ever formed distinct interests in society. Those who are creditors, and those who are debtors, fall under a like discrimination. A landed interest, a manufacturing interest, a mercantile interest, a monied interest, with many lesser interests, grow up of necessity in civilized nations, and divide them into different classes, actuated by different sentiments and views. “The regulation of these various and interfering interests forms the principal task of modern legislation, and involves the spirit of party and faction in the necessary and ordinary operations of government…. Please look for the next blog post, “A different kind of nation,” to appear on or about Friday, October 28. [i] Thomas Jefferson to James Madison, November 18, 1788, in Thomas Jefferson, The Republic of Letters: The Correspondence Between Thomas Jefferson and James Madison, 1776-1826, 3 vols., ed. by James Morton Smith (New York: W.W. Norton, 1995), vol. 1, p.567. Jay Scoffield is a recently retired police detective and regular reader of this blog. He responds here to our earlier discussion of safety and self-defense (blog posts 5-26, 6-3). In addition to being a patrolman and detective, Jay has served as a field training officer and his Department’s first mental health liaison officer. He also taught part-time at his local community college for 16 years while a police officer. The courses he taught included self-defense and domestic violence, among others. His thinking reflects a constructive attitude and deserves consideration. I have practiced various means of self-defense throughout my career as a police officer. While I have trained in many, Aikido found me. I want to share my thinking here about a method of self-defense that I consider particularly effective, both physically and as a means of progress toward a world I can believe in. I don’t see Aikido as the only answer available to us when those tense moments come. 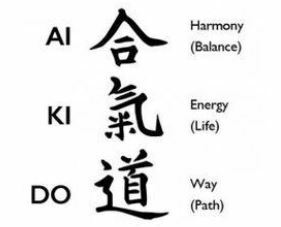 But I do find the philosophy of Aikido compelling. I offer a short summary here that reflects my training and experience. Having compassion for people is at the heart of what passionate people do. I appreciate the Greek definition for compassion, to care from deep within oneself. For instance, the Bible refers to “the bowels of mercy” using a verb sometimes translated from the Greek as “to be moved with compassion or kindness” (Matthew 14:14, Mark 1:41, Colossians 3:12). Mercy is an essential ingredient in justice, as is forgiveness. Evidence exists of what some in behavioral sciences are calling the second brain; a brain that exists, if you will, in our gut. Scholars also suggest that each and every cell in our bodies gathers information concurrently with our brain. Humans can learn to do things very quickly. It’s a good idea to train our brain to check in with our gut, or that area where “the bowels of mercy” are located. I think many of us have forgotten how to feel deeply, thus the path to being centered is lost. In the art of Aikido, we learn how to center ourselves. I function at my best when centered. Strangely, this helps one to function better when force is used. And centering can be helpful in situations that require force or diffusing. If I am fully present and centered myself, I can center someone by my mere presence. Centering someone can be as simple as a touch to the shoulder or an empathic ear. Sometimes we may have to reach into our tool bag for other things. When a police officer uses force the goal ought to be to get a person re-centered. This requires the officer to be centered before and after the use of force. After the use of force, the officer must lead the person to his/her path of re-centering. This can only be done with love and compassion. Sadly, some folks will never be centered. Deadly force may be necessary to protect your life or the life of another. Could this be the penultimate experience for police work? I don’t think so. I think showing compassion and love is the ultimate experience. This model can extend to extremists as well. We have dealt with militant forces before. Will love or compassion overcome these things? Sometimes I don’t think so. But at the end of the day, I truly believe humanity has the upper hand – a humanity based on love. Dear readers: The next post, “Freedom and Stability”, will initiate a series on the creation of the United States Constitution in 1787 as a visionary and pioneering structure for a newly emerging democratic republic. Please look for it on or about September 30.